Lash Extensions are made of synthetic fibers that look and feel identical to a natural lash. The lash extensions are available in mink and silk. Mink lash extensions are matt and have a more natural look; silk extensions are glossier and mimic a 'mascara look'. I also offer Siberian mink lashes which are real mink fur and harvested from the mink animal - these lashes are of the highest quality, cruelty-free, are sanitized and permanently curled. Lash extensions come in many lengths and curl types and can be customized for the look you desire. Lash extensions are waterproof and permanent until your natural lash sheds (average growth cycle of a natural lash is 60 days). To fill in the spaces where your lash has fallen out, you will need to come in for touch-up (fills) appointments every 2-4 weeks. The amount of time your between fills varies based on your age, thickness of your natural lash and your adherence to proper aftercare. Lashes are applied to the outer 1/3 of the eye to create a cat-eye look. Looks best on those with dark natural lashes. For those who want to try out extensions or want a subtle change (available in black and dark brown). 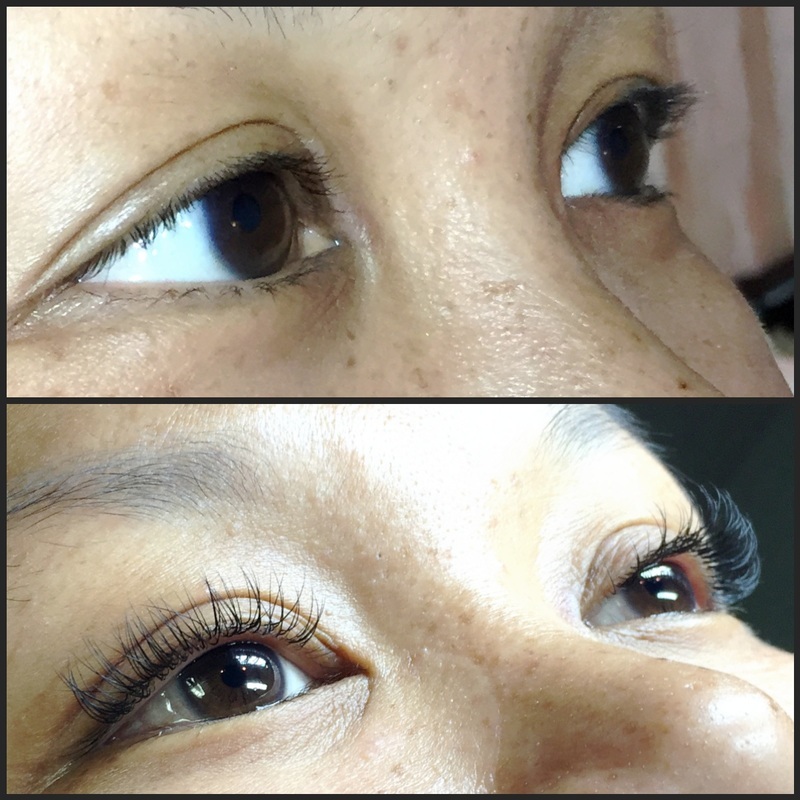 $75 - $125 Pricing depends on your natural lashes; a fuller amount of natural lashes will require more lash extensions and more application time for the service. Lashes customized for your eye shape and lifestyle. Lash extensions are applied to every natural lash from corner to corner for a natural 'mascara' look. This set will eliminate your need for eyelash curlers or mascara since the extensions maintain their curl and deep color (available in black & dark brown). Lash extensions are applied corner to corner and on every natural lash. Combination of single lash extensions and 2D/3D lash extensions. Hybrid set. Application takes 1.5 - 2 hours depending on natural lashes and desired fullness. The client in this picture has the 5D volume service. This technique is an application of 5 very fine lash extensions which are fanned out and attached to each natural lash. The volume technique creates a fuller, fluffy look that emulates a false eyelash look. Russian Volume lashes are available 2D - 5D. $250-$350 and up depending on volume (2D-5D) and your natural lash fullness. Upgrade to cruelty-free real Siberian Mink fur lashes for a more natural long lasting look. The above prices are in addition to the regular lash extension service price. Glitter lashes. Add some flare for the holidays or special occasions. Glitter lash extensions can be applied just to the outer corners, every other lash or to the entire eye. Glitter lash extensions come in gold, black, silver, purple, red, green and blue. Duo-toned lashes. These lashes are black at the base and have an colored ombrè toward the tips. Duo-tone lash extensions can be applied just to the outer corners, every other lash or to the entire eye. This is a very subtle way to add a little flare to your look. Duo-tone lash extensions come in purple, blue, red, green and brown. Colored lashes. Lash extensions are available in all colors. Get as creative as you want with your lashes! Colored lash extensions can be combined for a rainbow effect, one solid color, 2 colors or more per eye and more. Very popular for Burning Man and Halloween! Available in red, yellow, blue, gold, green, purple and pink. Swarovski Crystal lashes. Add some 'bling' to your look with real Swarovski Crystals lash extensions. Add that twinkle to your eye with the highest quality crystals in the world. Kick off the holiday season with a flash of radiance sure to captivate attention at any occasion. Available in silver, red, purple and gold. $40 upgrade for 2 Swarovski Crystal lash extensions. I offer a complimentary 10 min consultation to assess the condition of your lashes, create a repair/rehab program customized to your unique situation. Pricing for this service is based on time. Call to schedule and appointment for your free consultation. Mini-fill needed primarily on the right side. This client sleeps on her right side which causes her lashes to fall out faster on that side. This is a light natural set. Also mini-fills are used if you want to go fuller and thicker - you can return in one week. Every 2 weeks is the sweet spot to have your lashes filled. If you return every two weeks - your lashes will always look full and luxurious and never 'gappy'. This photo is of a client who has real Siberian Mink Fur lashes. The Siberian Mink tends to last longer and you can get longer lengths because of the light weight nature of the real mink lash extensions. $75 - $150+ depending on amount of lash loss, fullness and application time. This photo has been blown up to show how lash extensions grow out. The two lashes in the middle of the eye have grown out from the base. 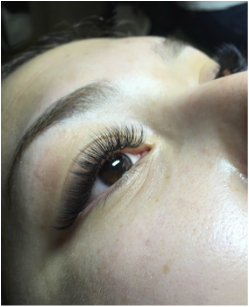 During your fill appointment - those lashes are removed and a new lash extension is applied as close to the base of your natural lash without touching your skin. All new natural lashes will have new lash extensions applied. You can also see that her natural lashes have not been effected by having lash extensions. Lash extensions can create a dramatic difference effortlessly which gives you confidence in your natural beauty and opens up 'the window to your soul'. For before and after photos check out the Lash Gallery Page or my Yelp page. * All photos are of my own clients (except for the 'lash enhancements') and have not been re-touched in anyway. For more before and after photos and to read reviews about my work see my yelp page.